Michael Tse’s (謝天華) career had a brief scare when a netizen shared on Weibo that she had slept with him. The essay, titled, “I slept with Laughing Gor” went into detail about Michael’s alleged encounter with a Mainland Chinese woman, ranging from Michael’s kissing skills to his bed tricks. The woman also shared a photo of Michael’s wristwatch and glasses, claiming that she she took them when Michael was in the shower. The items matched what Michael wore at a past event. After leaving TVB in 2013, Michael went to Mainland China to further develop his career. He only recently returned to Hong Kong to start rehearsals for his upcoming musical concert The Storm Show <風雲5D音樂劇> with Kevin Cheng (鄭嘉穎), Ray Lui (呂良偉), and Wayne Lai (黎耀祥). 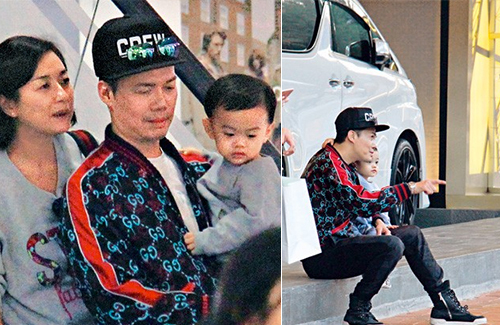 Last week, Michael and his wife were seen shopping around Causeway Bay, bringing along their 1-year-old son Theo. The Tse family spent all afternoon shopping in luxury shops and buying toys. Theo, who will be turning two in February, was by his father’s side the entire time. Last year, Michael purchased a residential property in Tai Hang for over $37 million HKD. Michael plans to enroll Theo into a daycare school after he turns two. Though Michael wants to enroll Theo in an international school, it was said that his wife, Tina, wants Theo to attend a traditional school. little Theo is so adorable. michael at 49 still looks good. Aww…what a such adorable kid. Hm…I don’t know if it’s me or I think the wife look older.